"Religious leaders in the Tibetan Buddhist tradition are not above the law," said one of the people who met the Dalai Lama. 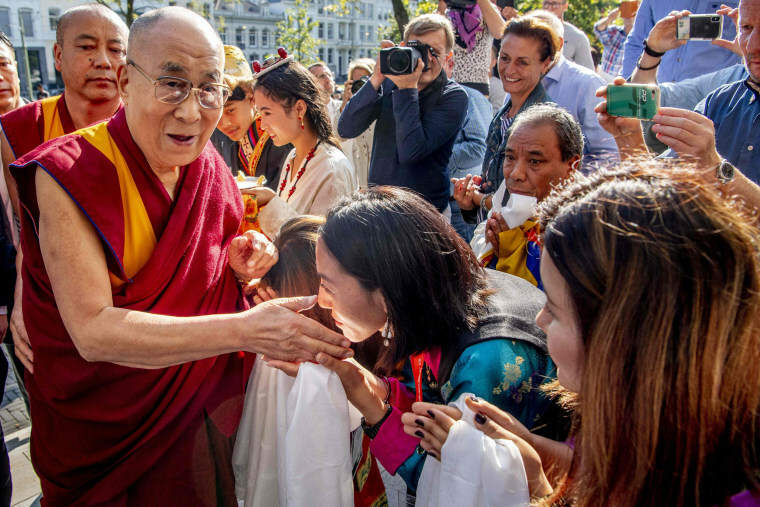 ROTTERDAM, Netherlands — Four people who say Tibetan Buddhist teachers abused them physically or psychologically presented the Dalai Lama with written accounts from 12 alleged victims in the Netherlands on Friday. Using the hashtag "metooguru," the group gathered some 1,300 signatures in an online petition calling for a meeting with the spiritual leader so he could receive its collection of testimonies. The Dalai Lama, the leader of one school of Tibetan Buddhism, met with four representatives for about 20 minutes on the first day of a four-day visit to the Netherlands. Organizers of Friday's meeting at a Rotterdam hotel hope the Nobel Peace Prize winner will use his moral authority to influence the faith more broadly. "What we want from him is that he is very clear about the fact that religious leaders in the Tibetan Buddhist tradition are not above the law," said Oane Bijlsma, one of the four people who met the Dalai Lama. "That, even if they claim that their tradition endorses behavior that is supposedly beyond good and evil, it can never be the case." The Dalai Lama did not speak to reporters afterward. Members of his entourage did not immediately respond to requests for comment.